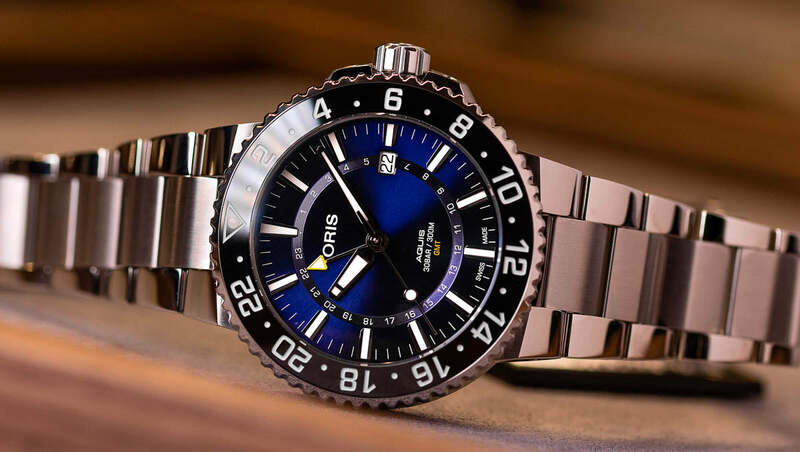 Expansions to the Oris Aquis Diver Range. 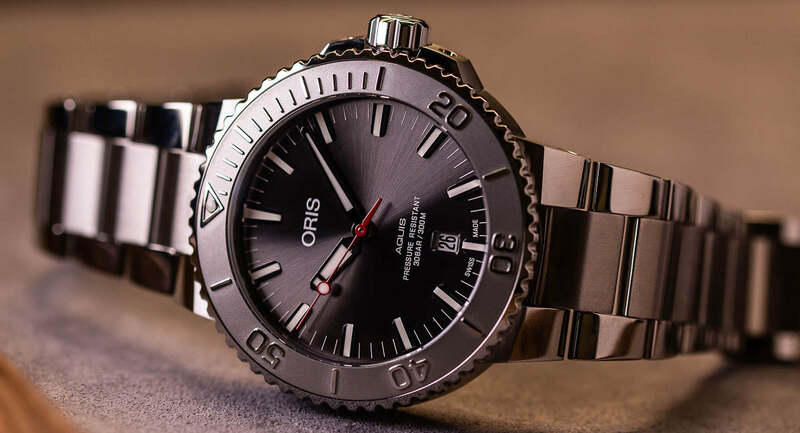 The Oris Aquis range from Oris is not only an incredibly popular collection of watches but it also offers insane value for money. The main difference between these models is the new colourings. As you could probably guess, the watch has been inspired by water. 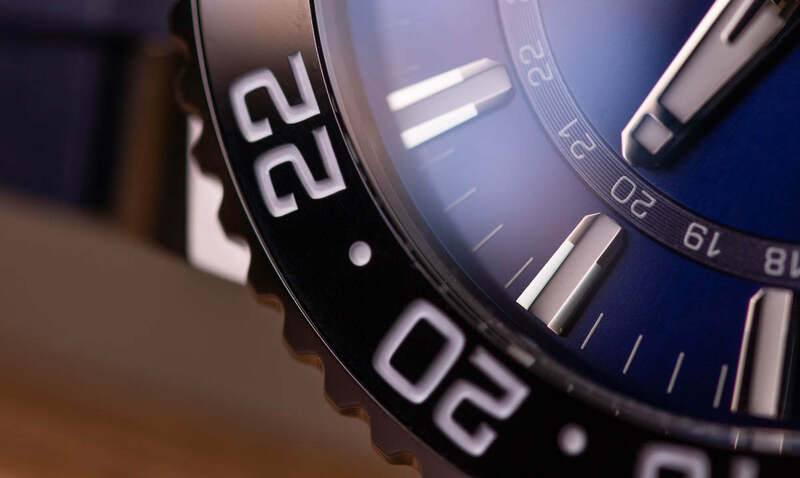 The grey dial recalls the colour of a stormy sea with the bezel acting as a reminder of the texture of water. For me, the one to go for here is the red rubber strap option. 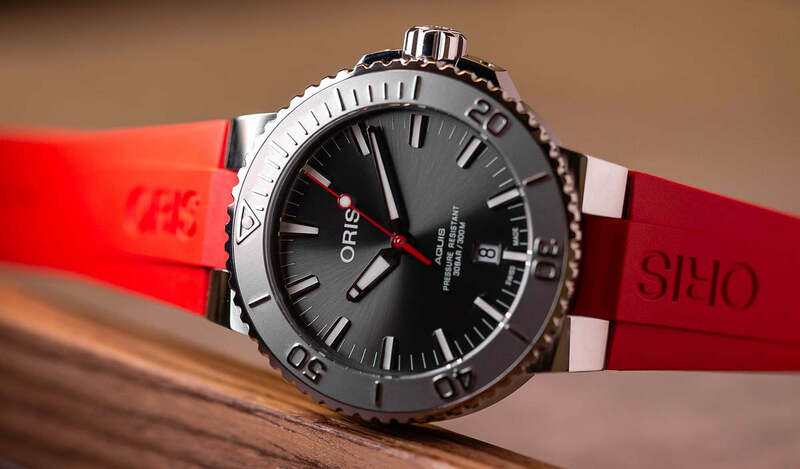 The bracelet, grey leather and grey rubber add more emphasis to the red seconds hand, however, the red strap really makes the watch pop on the wrist. Sticking with the theme of preserving the bodies of water in our world and we have this limited edition. This model has been created in close partnership with the Reef Restoration Foundation. Since releasing previous great Barrier reef models, the issue has only got worse, something both companies involved seem to feel pretty serious about. Moving away from the great cause behind this watch, the design of this model is easily one of my favourites. 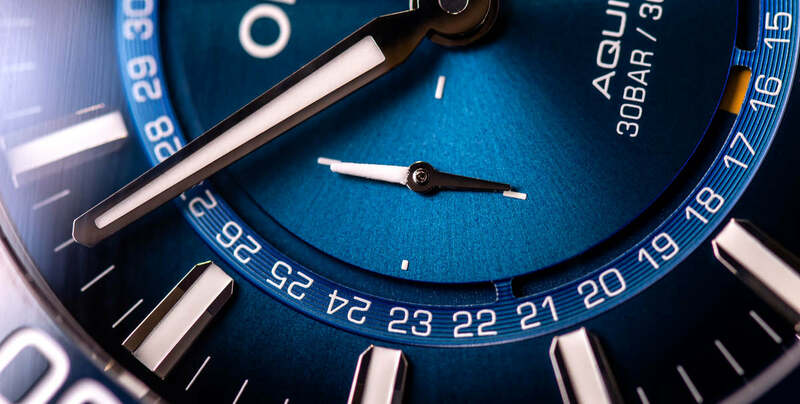 The dial is a gradient blue colour which gets lighter towards the middle. The bezel is a dark blue tone, the triangle at 12 and the date function have all been finished in a yellow/orange colour. On the wrist, the colour feels great. I can only imagine how cool this would look in bright sunshine. 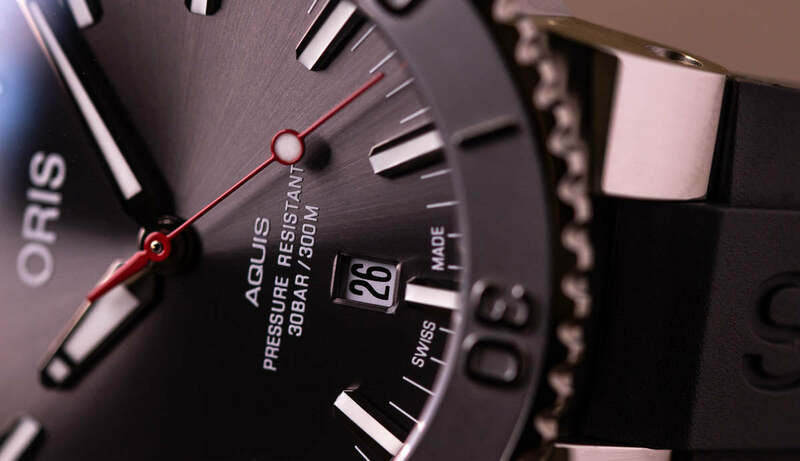 Next up we now get a GMT added to the Aquis range. This is something which has been lacking from the Aquis line up, so I'm pleased they have spent the time to release it the correct way. 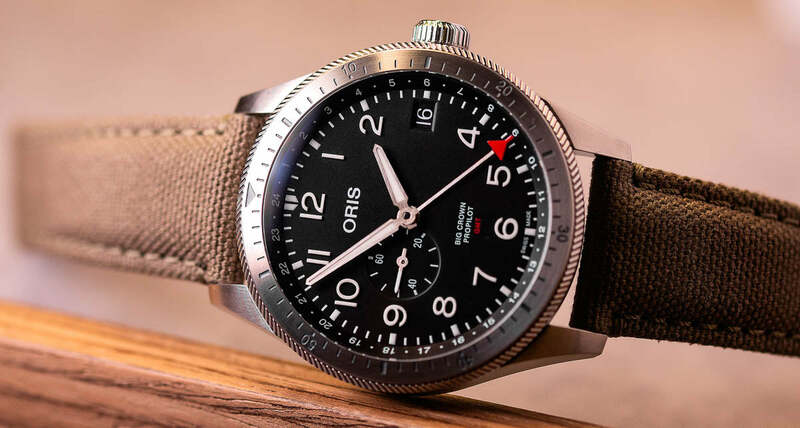 Rather than just bolting on a standard full-size GMT, Oris have gone for a shorten hand, tipped in orange and a more centralised track. 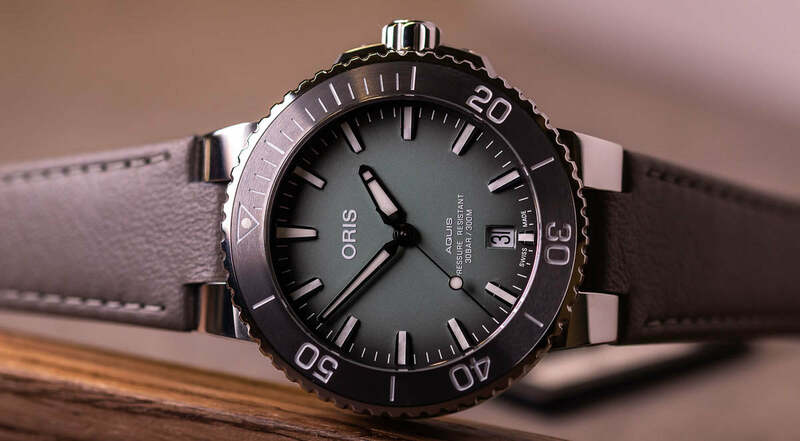 Once again this model comes in at 43.5mm which Oris actually confirmed is their most popular size. In person, this watch has a great practical, do anything go anywhere feel to it. The dashes of light orange on the dial and GMT hand add nice final touches of sportiness. Strap wise, there is a bracelet, leather and rubber option to go for. For me, the bracelet wins this one. Here we have a new 39.5mm Aquis Date in brand new colours and tones. This is a smaller diving watch that goes for a mint/grey gradient look. The overall look of the watch is more of a pastel shade, meaning it does feel a little more feminine when compared to others in the range. However, saying that, the watch feels very unique and fun on the wrist. In my mind, there is no doubt this is a unisex watch and can be enjoyed by all manner of wrists. 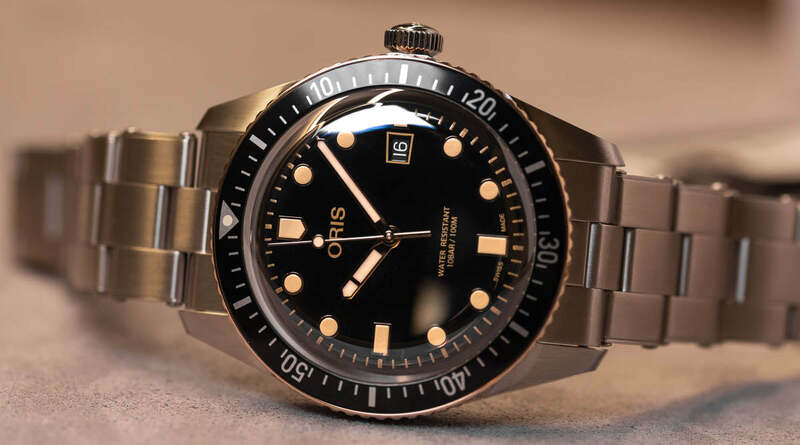 So, the first two new Oris Sixty-Five arrivals this Baselworld 2019. First, up a new green dial which, much like we found out in our 10 for 10 series recently here, compliments bronze insanely well. This watch only emphasises this more by combining the bronze edged bezel, cream coloured lume, gold colour indices and hands. The other new colour we were shown was the new black dial version. This keeps the same bronze edged bezel, and gold coloured dial details like the green option. This is a 42mm model complete with a domed sapphire crystal to really make the watches old school style pop. 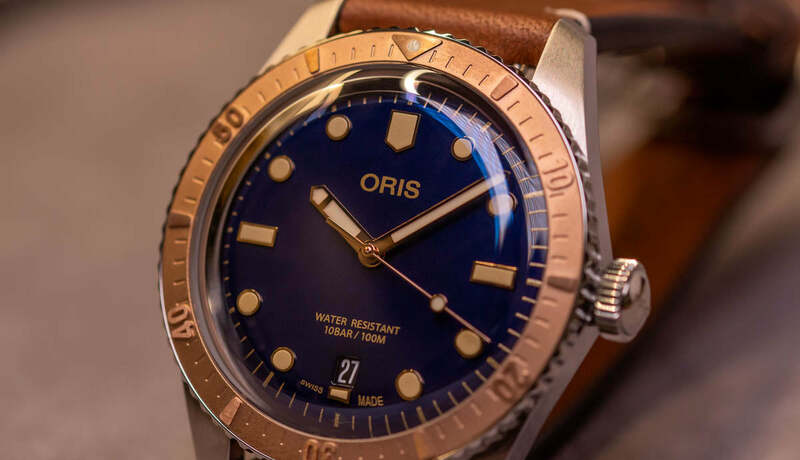 Oris now address the 40mm Sixty-Five diver and release a steel and bronze version with a curved blue dial. This watch has such a classy, appealing look. At 40mm the watch is very wearable for a range of wrist sizes which is a good thing, as I think we'll see this watch out in the wild a lot. 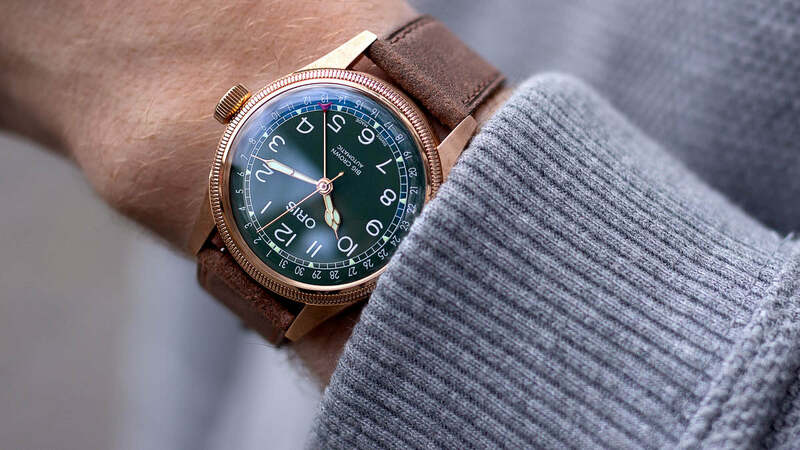 The combo on the rivet bracelet, all bronze coloured bezel and great price point, it's hard to argue this isn't one of the best hits of Baselworld 2019. 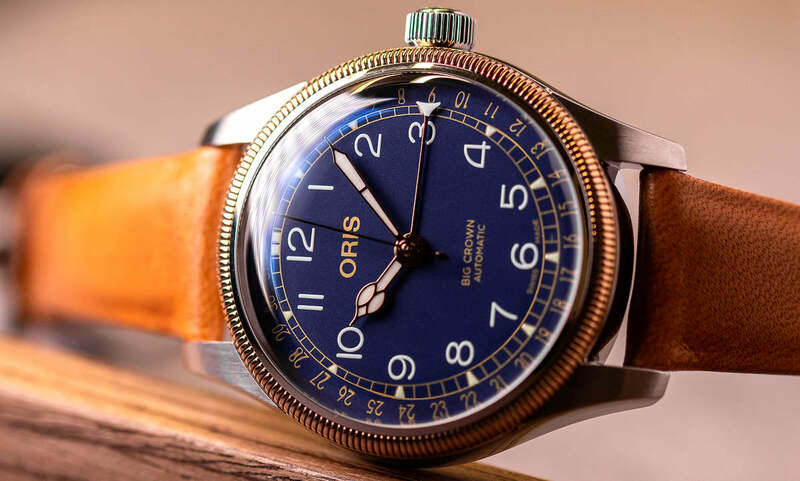 And finally, we end with one of the most important models for Oris, the Big Crown Pointer Date. We've already learnt about the Pointer Date 80th Anniversary in detail here, so let's jump straight into the 2019 models. This model is actually available with two different strap options, however, both are very similar. I'm used to the 40mm Pointer Date (10 for 10 anyone?) yet I found it refreshing to wear a smaller edition of the Pointer Date. To me, this model feels a lot more faithful to the original Pointer Date's we have seen over the years. 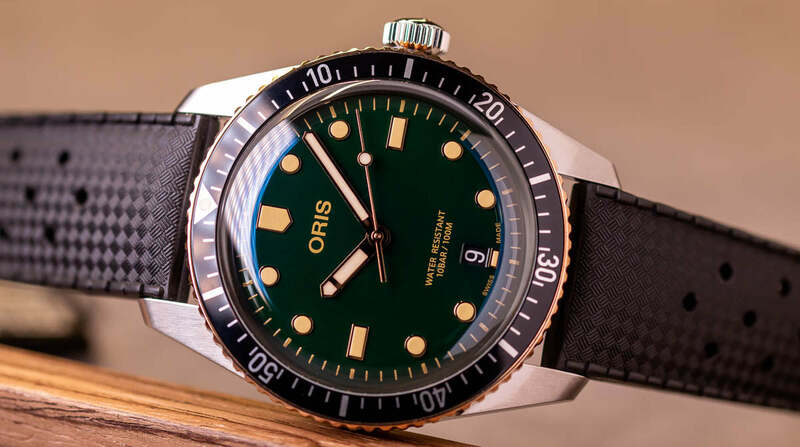 Nice one Oris! Finally, for the Pointer Date, we have this gem. A glossy red dial Pointer Date dial with either leather strap or bracelet. There isn't really too much to say about this one. Just look at it. 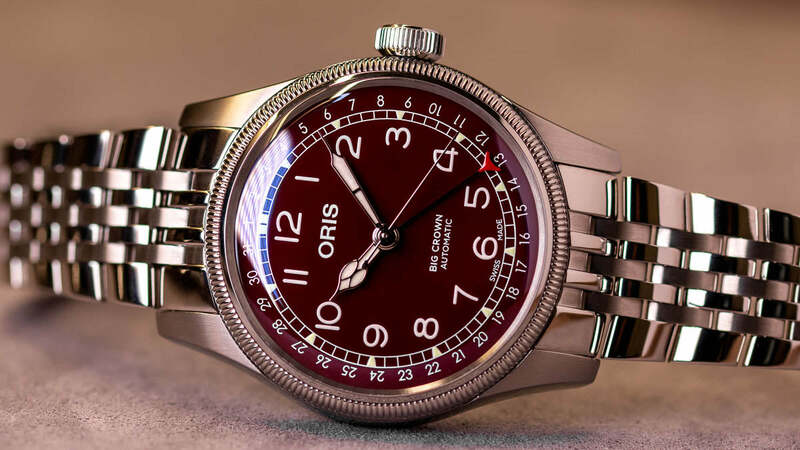 The deep red dial really makes this watch look classy as hell. On the wrist, it feels just right smart and proper. Enough to work as something you only wear on more special occasions, and yet at the same time throw it on the leather strap and it's a watch that regularly sits on your wrist. 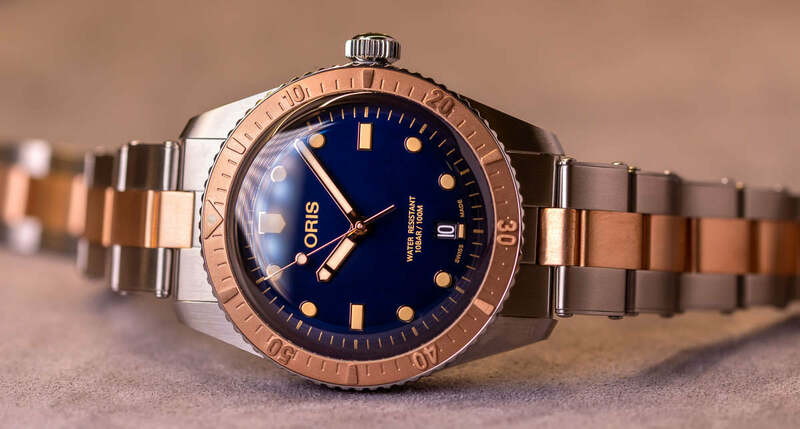 There was one more release we got some hands-on time with at Baselworld 2019. This ProPilot Timer GMT does come in at 44mm wide, however, the large matt black dial, with highly legible indices and large hands means this watch feels very purposeful on the wrist. The stainless steel bezel as well also adds a nice sporty vibe to the watch, adding further emphasis to the red GMT hand. 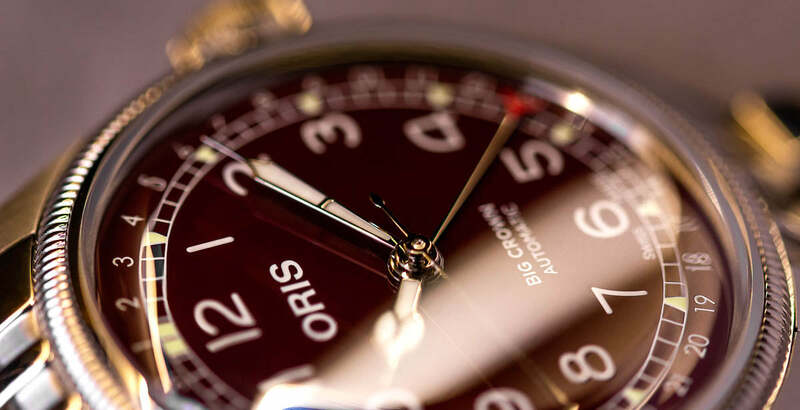 A great way to summarise one very busy year for Oris. Their continued conscious efforts to protect the waters of the earth in a contemporary way, along with their desire to respect the history of the company is compelling to experience in person. 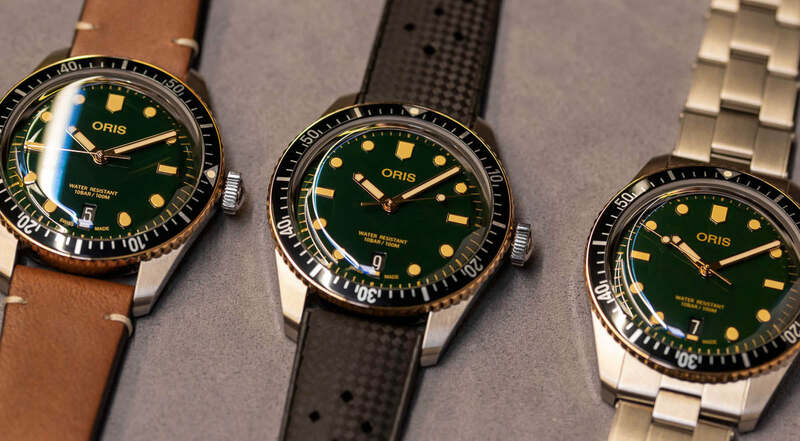 This year at Oris, they decided to take their conscious efforts further by changing the food and drinks provided at their stand at Baselworld 2019. Sushi was dropped from the offerings this year and replaced with sandwiches that used all locally sourced ingredients. All water was replaced with tap water and served in glass bottled. Fresh juice and fruit were available. Coca Cola wasn't offered. And only local beer was served rather than imported. 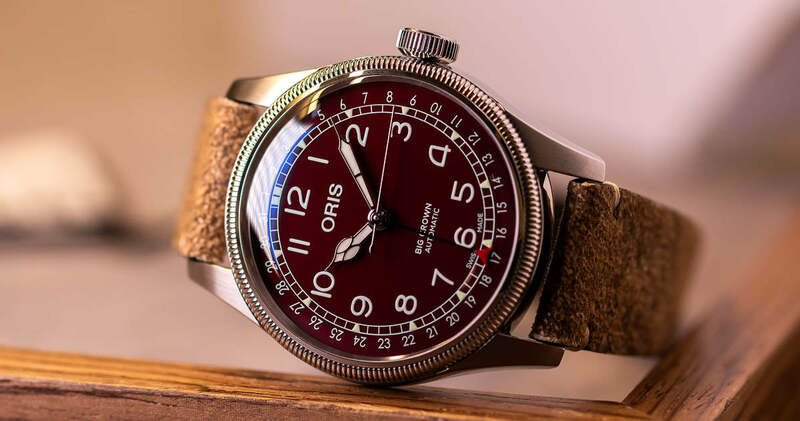 To that (both watches and local beer) we say cheers Oris! 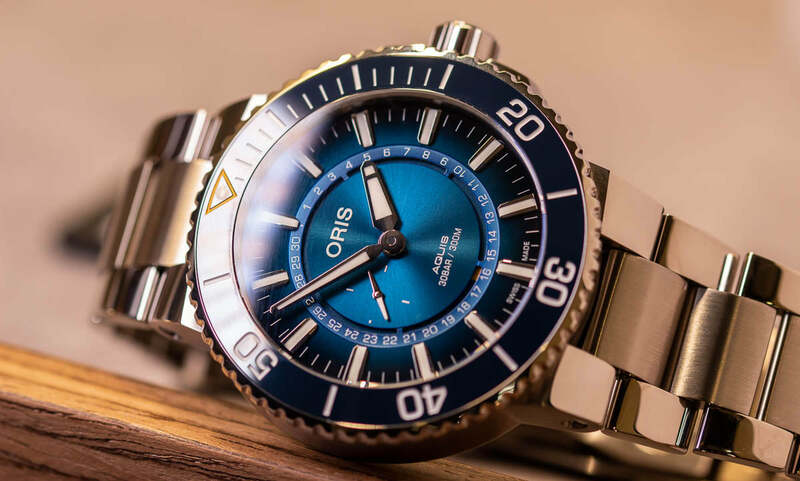 Find out more about all the Oris releases here.